We hope that the following information will serve to remind and familiarize current members with the history of our community and St. Andrew's contributions to that history. Should other readers become interested and wish to join us in worship, we extend a warm hand of welcome. In 1850 Thomas Bums, a loyal and probably nostalgic Scot, settled on top of Ben Lomond Mountain to grow grapes and make wine. He named his mountain for the historic mountain of Scotland, the land of his birth. Thirty-seven years later, J.P. Pierce, the enterprising owner of the Pacific manufacturing company, and Thomas L. Bell, his mill superintendent, laid out a town site at the foot of the mountain on the flat north bank of the San Lorenzo River between Hick's Ford and Priest's Ford, both now sites of bridges on Highway 9. Pierce wanted to call his town "Pacific Mills," but when he applied for a post office, the postal department took exception to the commercial association of the name proposed. He and Bell then settled on a second choice, "Ben Lomond." In 1899 twelve Episcopalians of Ben Lomond raised money to buy land and to build a church. Benjamin and Gertrude Dickinson, Thomas Bell, and William Lamb are recorded as principal organizers and significant contributors. During fund raising and construction, the Rev. C.O. Tillotson, rector of Calvary Church in Santa Cruz,arranged for services in Ben Lomond Hall. 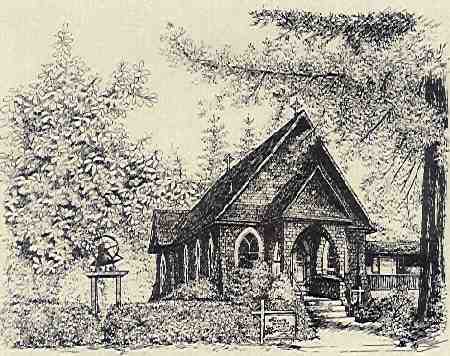 The church was constructed by a Mr. Hopkins, and in July, 1901 Bishop William Nichols consecrated the little redwood church named for the patron saint of Scotland. When the church building was completed in 1899, lumbering in the San Lorenzo Valley was at its peak. Boulder Creek was a major railhead for California; mills shipped vast quantities of timber through it. The loggers worked 66 hour weeks and spent their Saturday nights in the many saloons strung out along the main street. Down stream in Ben Lomond, life was quieter. Once the surrounding hills had been logged of their giant redwoods, the mills moved on upstream. Attempts to farm the denuded slopes left behind met with indifferent success. Ben Lomond and St. Andrew's were fortunate, however, because there was a new interest in the San Lorenzo Valley. With the coming of the railroads to Ben Lomond in 1884, campers from San Francisco and elsewhere began loading their gear on trains heading for the Santa Cruz Mountains and Ben Lomond. Within a few years Ben Lomond acquired fine resort hotels built to accommodate those campers who preferred to sojourn with damask on the table instead of canvas overhead. People who could afford mountain cabins put them up on likely lots along the river, the creeks, and the established mountain roads. Those of true affluence commissioned rustic but highly comfortable summer homes complete with tennis courts, swimming "tanks," and cabins for their help. St. Andrew's has always served Episcopalians in two categories: Episcopalians living in the San Lorenzo Valley the year round, and Episcopalians coming to the San Lorenzo Valley on vacation. The little church did well enough in the summers, quite often filling its pews. After this auspicious beginning, the congregation began to dwindle until, in the fall of 1911 there were but three communicants. Thus, in the winters from 1911 to 1950, St. Andrew's generally locked its doors and hibernated. For the next 15 years St. Andrew's served principally as a summer chapel, and the optimism of the planners of 1899 gradually gave way to discouragement. Two men, both rectors of Calvary Church in Santa Cruz, deserve particular mention for their part in keeping St.Andrew's alive during the hard years from 1911 to 1950: the Rev. Messrs. C. L. Tillotson and Norman Snow. In 1950 St. Andrew's welcomed its first full time vicar, the Rev. John Davis Lee. His arrival signaled the stable future. Times of scarcity and of plenty continued in sequence, but without the old intensity. St.Andrew's gathered in new members, many of them new to the Episcopal Church,and moved into its third quarter century with excellent promise. Under the leadership of Father Joseph R. Kennedy, who came in 1974, St. Andrew's became a vigorous, self-supporting mission, and then in 1979, in a ceremony at Grace Cathedral in San Francisco, a parish. In 1980 St. Andrew's became a part of the new Diocese of El Camino Real. The great storm, which devastated the Santa Cruz mountains, in 1982 saw St. Andrew's become a leader and a community center for emergency aid services in that tragic time. For a week, with help from the outside blocked, St. Andrew's and the Ben Lomond Volunteer Fire Department rescued, fed, and housed all those in need. St. Andrew's received national television recognition on several network news broadcasts for its endeavors. The tragedy also welded ties to the community which continue to the present. In 1988, St. Andrew's welcomed The Rev. Colville Smythe and his wife, Sylvia. The Smythes' strengths were in welcoming new members and programs. Examples are the Easter Egg Hunt at their home, a third Sunday morning service, large numbers of confirmands each spring, adult education programs, grief groups, Kirking of the Tartans, Mardi Gras, a service for children at Christmas, and emphasis on music programs. The earthquake of 1989 once again brought St. Andrew's into the forefront when it contributed over $12,000 into the community and housed people during the disaster, establishing it as a permanent Red Cross disaster center when needed. The rector Rev. Linda Wood served St Andrew's from 1997 through 2000. Linda's strengths were in liturgical music, creating discussion services, and exploring the liturgy of New Zealand Anglicans and Celtic Christianity. She also brought a feminine perspective to the parish and instituted monthly children's services and an active acolyte training program. During this period St. Andrew's was challenged with roof damage from a tree that evolved into many expensive repairs. Many fund raisers were held and the church continued to be an important element in San Lorenzo Valley. The vestry elected a new rector, Rev. Keith Johnson who accepted the position on April 1st 2003. You can view some memories the parish has of his Installation here. We enjoyed the exuberance and enthusiasm he added to the life and history of our church, including a gospel choir. His family's health needs neccesitated relocation in Florida. In 2009, Father Blaine Hammond became our Rector. We look forward to his guidance as our church continues to evolve. Church cat, Sister Blanche, now retired. St. Andrews' property of 1/4 of an acre includes two buildings, the historic 1901 church and the parish hall. The church is solid heart redwood, and seats about 120 in the congregation. The organ was specially built and installed for St. Andrew's by Preston Boomer in 1960, with the help of his high school students, and his friend,the late Bill Reed, who was a professional organ builder. Boomer spent his inheritance from his grandfather, Preston H. Boomer, to buy the pipes for the organ, and it is dedicated to his memory. The church is enlivened by a number of works in stained glass executed by local artists. The sacristy is said to be the smallest in the Diocese. The parish hall was built in 1963, with a second story added in 1982, with much of the labor donated by the volunteer firemen and others in recognition of St. Andrew's work during the 1982 flood and its aftermath. The building includes offices for the rector,the church secretary, and the preschool director. It contains a large meeting area, used for the preschool, a nursery, and, on the second floor,an office and meeting room. St. Andrew's is proudly wheelchair accessible. Volunteers, under the direction of Doug Westphal, built a wheelchair ramp up to a new side entrance in 1993. In 1995, St.Andrew's began an aggressive restoration campaign to restore our historic building. Seismic retrofit; cedar shingles, painting, and copper gutters. ADA ramp for wheelchair access, new windows; new deck; carpeting; refinishing of floors, and ramp to upstairs. ...and an amazing amount of landscaping as Tillie Cunningham started a very successful Gardening Guild. St. Andrew's Church in Ben Lomond is situated in the redwood forests of the San Lorenzo River watershed. Ben Lomond, along with Brookdale, Boulder Creek and Felton, comprise the unincorporated towns of the San Lorenzo Valley. The altitude of Ben Lomond is about 400 feet, the mountains around rise to above 2,000 feet. Most of the San Lorenzo Valley is above the coastal fog, but also in the rain shadow of the mountains. Thus Ben Lomond is sunny, dry and warm in the summer, but often rainy and a bit chilly between November and April. Recent rainfall totals have ranged from 26 inches to more than 100 inches for the period, frost is not uncommon, and parish children hope for (the rare) snow. The City of Santa Cruz, long recognized as a favorite destination for a vacation at the beach, has evolved into a rather cosmopolitan university town with a population of about 50,000. Santa Cruz is the county seat for the San Lorenzo Valley, and it lies 15 minutes to the south on Monterey Bay. Santa Cruz is the home of the University of California, Santa Cruz. Cabrillo college, an excellent community college, is located just south in Aptos, offering a wide range of courses, both day and evening. Here in Santa Cruz are also found excellent hospital facilities, restaurants, and theater and music. The Santa Cruz Shakespeare Festival is second only to Ashland in the eyes of many, and the Cabrillo Music Festival is widely acclaimed as well. Musical endeavors range from the annual Baroque Festival to the Kuumbwa Jazz Center. Dance, theater, art, and crafts groups flourish in the San Lorenzo Valleyand throughout the county. In addition, the fertile river bottom soil in many parts of the San Lorenzo Valley has helped to make wine making and organic farming a vital part of our community. There are more than 25 farms, orchards, and gardens open to the public in the Monterey Bay Area, as well as the world renowned UCSC Arboretum. In addition, there are the teaching gardens at Camp joy in Ben Lomond and the UCSC Farmand Garden on the UC campus. Both attract apprentices from around the globe. To the north, over the mountains, is San Jose and the metropolitan bay area. The drive to San Francisco takes about an hour and a half. The rapidly growing town of Scotts Valley, where St. Andrew's helped establish the mission of St. Philip's the Apostle, is about 10 minutes to the east. The development of Silicon Valley (Santa Clara/San Jose metropolitan area) in Santa Clara County, and the resulting demographic changes, have contributed to the growth of the San Lorenzo Valley. The three large state parks in the San Lorenzo Valley, Henry Cowell Redwoods State Park, Fall Creek State Park, and Big Basin State Park are greatly enjoyed by local residents and attract visitors from near and far. The San Lorenzo Valley had a year round population of about 20,000 in 1990, up from about 17,000 in 1980. Many of St. Andrew's parishioners commute, either to Santa Cruz, Scotts Valley, or to Silicon Valley. Housing, while slightly less expensive than in surrounding areas, is by most standards costly: median rents in 2000 were $1200.00 and median home values for a three bedroom in 2000 were $300,000. Nevertheless, the San Lorenzo Valley is definitely not just a bedroom community, as it has several small but thriving business districts, and many community organizations.